When zucchini is in abundance, grate it up and store it in the freezer. Then when you want to make these muffins, thaw it, squeeze out the excess liquid and use it in this recipe. Somewhat healthy and you're getting the veggies in your kiddos! Preheat oven to 350 degrees F. Combine eggs, sugar, applesauce, butter, vanilla and zucchini in large bowl, mix well. Sift flour, cocoa, soda, cinnamon, powder and salt in separate bowl. Sprinkle a little flour over 1/4 cup of the chocolate chips. Mix dry ingredients into the wet ingredients. Fold in the flour coated chocolate chips. Scoop evenly into paper lined muffin tin. (I got 15 muffins.) 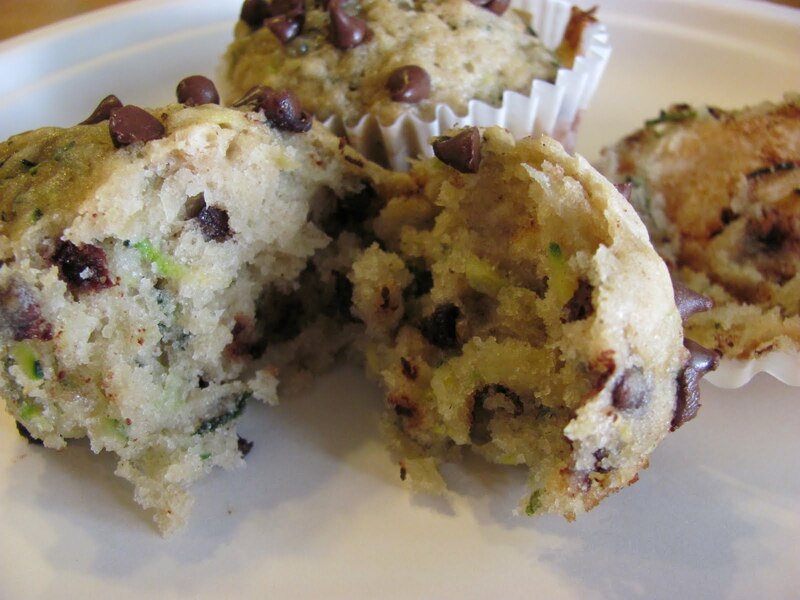 Sprinkle the remaining 1/4 cup chocolate chips over the top of the muffins. Bake at 350 degrees F for 15-18 minutes, check doneness with toothpick. I hope you'll give them a try! This looks delicious...I will have to make these soon...luv your blog!